Can writing about melancholy help alleviate it? Under the pseudonym Democritus Junior, this is what a 17th-century scholar was attempting to achieve through his book The Anatomy of Melancholy. The title caught my attention while working on the UK Medical Heritage Library (UK-MHL) digitisation project. Frontispiece image showing man haunted by melancholy, from The Anatomy of Melancholy. The original work was first published in 1621, but its popularity among scholars ensured its continued reprints centuries later. The recently digitised copy of this book is from an 1806 edition held by the University of Bristol. Helpfully, the 1806 edition comes with an introduction that serves as a biography of Robert Burton – the real name of Democritus Junior. In writing this book, Burton aimed to understand and relieve himself of his own melancholic moods: “I write of melancholy, by being busie, to avoid melancholy”. Beyond this – by exploring the causes, symptoms and cures of melancholy – he hoped he was writing for the common good of all. He wondered whether anyone was completely free of this affliction. Born in 1576, Burton was from an “ancient and genteel family” in Lindley, Leicestershire. Alongside an academic path as a fellow at Christ Church College, Oxford, Burton also pursued a career in the Church. 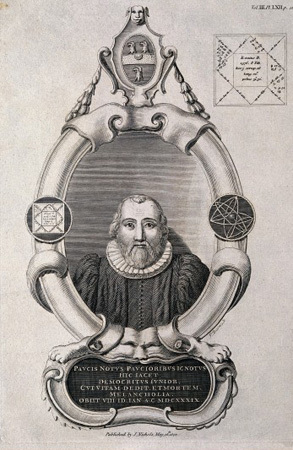 Starting out as a vicar, he went on to become Rector of Seagrave in Leicestershire in 1636. Apparently, this role of rector was one that Burton kept with “much ado to his dying day”. 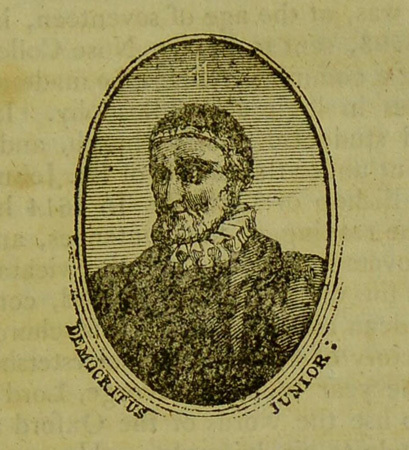 Portrait of Democritus Junior, from introduction of The Anatomy of Melancholy. Indeed, this contradictory nature reveals itself through Burton’s writing. His discourse is prefaced with a poem, The Author’s Abstract of Melancholy. At times his gloomy disposition is something to be savoured as reflected in the line “Naught so sweet as melancholy,” only later to be described as one of torment: “none so sowr as melancholy” and “naught so fierce as melancholy”. 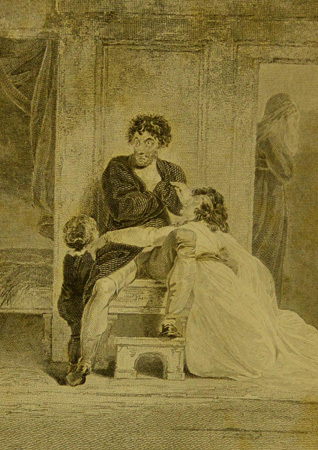 Amusingly, Burton says that he would like to “make a little observation” on melancholy but then manages to expand his subject over three volumes. He admits that his style is confusedly tumbled out. Although the work is peppered with Latin phrases, the main body of his writing is accessible to non-Latin readers like myself. In trying to understand the causes of melancholy, Burton reflects on the foolishness of humans and their hunger for war and riches. He also notes: “if men would attempt no more than what they can bear, they should lead contented lives”. The present-day reader may appreciate this sentiment: “Our time and person alter, vice are the same, and ever will be.” Interestingly, for a man of the Church, he condemns the superstitions and religious fervour of the age which are accompanied by little conscience. To return to the opening question: did writing this book cure Burton of his affliction? It appears the answer is no. According to the introductory account, the writing only increased his melancholy. However, he kept going back to his book and revising it – perhaps indicative of his worrisome nature. I imagine Burton felt impelled to explore his melancholia through writing; in a way, writing was his solace. Monument to Robert Burton in Christ Church Cathedral, Oxford. Line engraving by J Basire, 1800. Wellcome Library reference: no. 1556i. 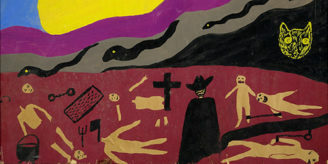 Some years before he died, Burton had predicted the date of his death. Following his actual death in 1640, it was rumoured among the students at Christ College that Burton had hanged himself “through a slip about his neck” to ensure that his predicted date was correct. The hanging is also alluded to in John Aubrey’s Brief Lives. For a man who drew upon writers before him, I would like to think Burton would have approved of his book being digitised: the idea that centuries later new readers would easily access his work. Burton likened writings as dishes offered up to readers as guests. The same can be said of the digitised works now freely offered up to readers online by the UK-MHL project. Burton’s metaphor-rich language. Extract from The Anatomy of Melancholy. Burton also admitted that he was not well-travelled, having lived a silent, sedentary and private life in the university. Such a man, I imagine, would have appreciated the idea that digitisation opens up library resources without the reader having to venture far. Indeed, you can explore more of Burton’s reflections on melancholy through the digitised book in the comfort of your own home. 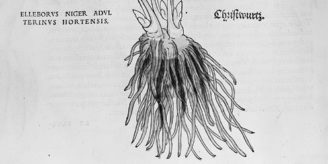 The digitised works in the UK-MHL collection are drawn from an intriguing and broad range of subjects related to the history of medicine. Harkiran Dhindsa is a freelance digital ingest officer and blog editor at Wellcome Library.